Ten motorists accused of dodging M50 tolls have been hit with fines totalling almost €100,000. Nicole Spellman, of Kilcarrig Green, Fettercairn, Tallaght, Dublin was fined €22,000, the highest amount in the list of cases. Another motorist who allegedly used Ireland's busiest motorway 800 times without paying had a bench warrant issued for his arrest after he failed to turn up for court. In all, the prosecutions which resulted in the €97,000 in fines imposed, none of the motorists who had been summonsed came to court. Cases against them went ahead in their absence. Judge Halpin imposed smaller fines on some motorists who made efforts to pay their tolls but said: "The people who disregard it totally are fined heaviest, they have no regard whatsoever". In one case he adjourned, he granted legal aid and said this was due to the seriousness of the offence. Judge Halpin said the authority was in charge of maintaining the roads and he warned: "If people want to use certain roads they have to pay; if they don't, the penalties are quite high". Each case finalised today featured five sample counts and photo evidence of how many times the defendants' vehicles had been detected using the motorway without paying the charge. Adrian Frandes, trading as Roomheat, with an address at Whitechurch Close, Rathfarnham, Dublin, was fined €3,000. The court heard the TII sent him just over 600 letters about the unpaid charges. His vehicle had a history of 174 passages with no payment received. Oleg Gherman, of Innisfree, Stepaside Lane, Sandyford, Dublin, had a car with history of 156 trips on the M50 with three payments, the last being on 31 July. He was sent 450 letters about the missed payments and he was fined €5,000. Ronan Rattigan of Templeview Avenue, Clarehall in Dublin, was fined €10,000 for his five sample counts. The court was told his vehicle had a history of 141 passages and no payments. Elena Ershova, with an address at The Lodge House, Killucan, Co Westmeath, was given €5,000 in fines. Her car had a history of 165 trips on the motorway with three payments and she was issued close to 500 letters. Marek Cornaga, of Armagh Court, Waterville, Blanchardstown, Dublin, was also fined €5,000. The court heard his car had made 177 trips on the M50 and there were six payments and he was sent around 500 letters about the tolls, the court heard. Mark Kealy of Drumcairn Drive, Fettercairn, Tallaght, was fined €14,000. His car had a history of 198 journeys on the M50 and no payments. He was sent approximately 600 letters by the TII. James Gallagher, with an address at Church Hill, Tullamore, Co Offaly, was the owner of a goods vehicle with a history of 447 trips on the M50 but no payments were received despite being sent 1,300 letters, the court heard. Lynn McLoughlin with an address at Lakeside Park, Newbridge, Co Kildare, was fined €5,000 over five unpaid tolls in September and October. The court heard since she became the owner, her car had a history of 170 passages with six payments. And Ted Purman, with an address at ongdale Terrace, Ballymun, Dublin, was fined €9,000. Judge Halpin was told his car had done 258 trips on the motorway but no tolls were paid even though he was sent 750 letters. The court has heard it was TII's policy to negotiate with defendants and some cases on the list were adjourned. 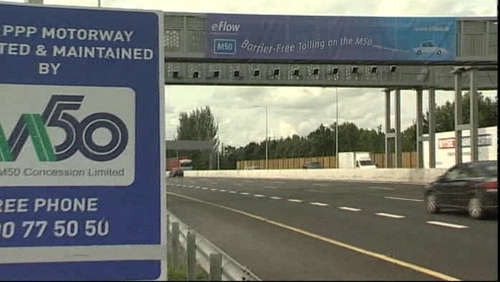 The standard M50 toll for an unregistered private car is €3.10 must be paid before 8pm the following day or there is a €3 penalty for having missed the deadline. Motorists have 14 days from the date of issue to pay for the journey and the initial penalty; otherwise a further penalty of €41 is applied.